Bark in the Park - fun for all! Dog parks are great for canine family members, but there are benefits for humans, as well. You can take a break from your routine and spend quality time with your best friend, outside, in the fresh air. You meet other dog owners and make new friends while your furry buddy is doing the same thing. And you can learn a lot by swapping tips and information with other dog people about food, training and even veterinary care. It's amazing how easy it is to make friends when you have a dog on the end of the leash! People with dogs know that letting their pets run loose may put them in violation of local leash laws, not to mention putting their best friends in danger. But they want a safe place where they can take their dogs to run and play off-leash. That’s the idea behind dog parks. A dog park is an enclosed place for dogs and their owners to meet and interact. Just like any community facility, there are things you should do and things you should not do at a dog park. First - know and obey the rules of the park. They are probably posted at the entrance. Second - pick up after your dog. You know what I mean – take a couple of baggies with you, in case the park doesn’t supply scoopers. Third - make sure your pet is up-to-date on its vaccinations before you let it interact with other animals. And, keep your dog on its leash any time you are outside the off-leash area. First on the list of things not to do - never leave your dog unattended. If your pet or someone else’s dog becomes unfriendly, you need to be there to prevent a confrontation. Don’t take a pet that is too young (usually less than four months old) because its immune system is not fully developed. Never take a female dog in heat. And avoid eating or smoking while you’re there. Food wrappers and cigarette butts not only litter the area but can cause digestive problems for animals that might eat them. 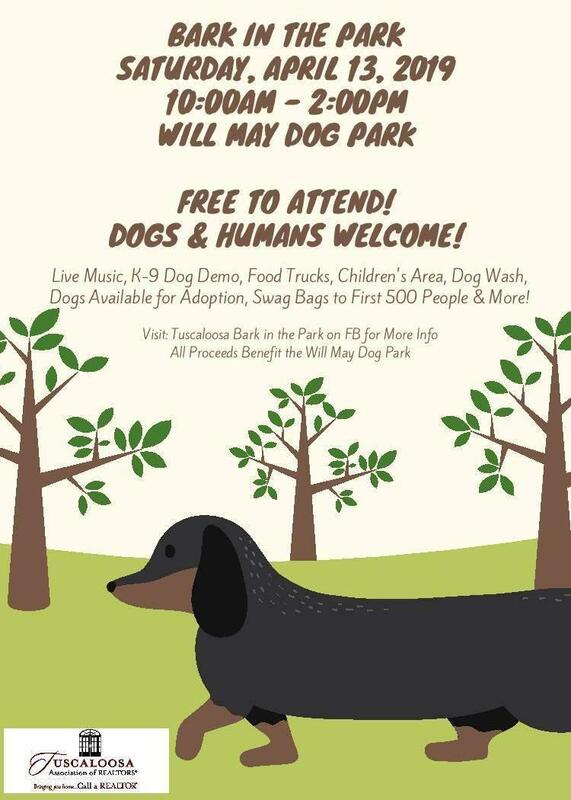 If you are in the Tuscaloosa area, check out the Will May Dog Park - part of Sokol Park, on Watermelon Road - for the annual Bark in the Park event, beginning at ten o’clock today. There will be live music, food trucks, a children’s play area – and dogs available for adoption. There is no entrance fee – and you can bring your best doggy friend with you (on a leash, of course). Bark in the Park is an annual fundraising event by the Tuscaloosa Association of Realtors; proceeds will go to maintain and even improve the Will May Dog Park for all residents, especially the furry ones, when you’re speaking of pets.